Lani Ramos, lead singer of her band, Big Pearl and the Fugitives of Funk (BP&TFOF), moved in the summer of 2000 from Los Angeles, CA, to New Orleans, Louisiana (NOLA) and is now a premiere singer of original NOLA rock & roll. A member of the Musician’s Union and Screen Actors Guild (SAG), Ramos a.k.a BIG PEARL has always maintained the name Big Pearl is a band name. 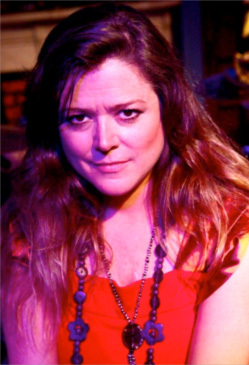 With a Mezzo-Soprano vocal range, Ramos writes, co-writers original songs of her own and with counter part and lead guitarist, Michael Wheat. In the recording studio Ramos is credited in coming up with original lyrics for back-up parts on independent projects right on the spot while singing and arranging the songs. Her credits include duet/back-ups with Dave Sharp of The Alarm, LOVE UNDERSTANDING, Rudy Mills Caribbean Funk, SAINTS IN THE POCKET and New Orleans artists Johnny J &The Hitmen, Big Chief Alfred Doucette, Mike Hood and Billy Ding & The Hot Wings. Before forming BP&TFOF, Big Pearl credits include opening for New Orleans notable acts like Earl King, Kermit Ruffins, Bonerama and Frankie Ford. Over the years Ramos’ solo credits include back-up performances with Frankie Ford at Tipitina’s, James Andrews & the Crescent City All-Stars and Chili Groove with the Southern University of New Orleans Orchestra (SUNO) at New Orleans Jazz & Heritage Festivals. NOLA has no shortage of private parties and Ramos has enjoyed living room sing-a-longs with the great Fats Domino, Father Jerome LeDoux and Dr. John. Since 2000, Ramos adds to her arsenal most all the clubs on Bourbon Street either with her band or as a gun for hire at clubs Tree Cou House ‘01-‘03, Funky Pirate ‘04, Tropical Isle ‘04-‘11, Snooks Bar ‘06, Krazy Korner ‘04, The Old Opera House ‘04-‘07, Howl At The Moon ‘04, The Red Rhino ‘02 and a weekly 3-night stint at My Bar, 2008-2010. In 2001 Ramos’ first single ARMS OF HEAVEN on compilation In Loving Tibute 9.11.01, was reviewed in Offbeat Magazine as the ‘quintessential song illustrating feelings over questionable tragedy’. Through the years Ramos has performed regularly in Frenchmen Street music venues like Checkpoint Charlie’s ‘00-‘03, Hookah Café ‘03-‘04, Blue Nile ‘02-‘11, Café Brazil ‘03-‘06, Apple Barrel ‘04-‘10, Ray’s Boom Boom Room ‘07, Café Negril 2007, Bicycle Michael’s ‘01, d.b.a. 2006, Lazziza’s ‘07-‘08 and The John ‘03-‘09. Off-shoot venues include Acadian Beer Garden 2001, Wit’s Inn 2001, Howlin Wolf 2001, Silky O’Sullivan’s 2002, Kim’s 940 ’03-‘04, Bada Bing’s ’03-‘04, Gennifer Flowers Kelsto Club 2005, Melvin’s 2004, The Hard Rock Café Dead Rockers Brunch 2004, Tipitina’s ’03-‘05, The Deck Bar 2004, Kajun’s Pub ’06-‘07, Bud Rip’s 2007, Turtle Bay 2009 and The Maple Leaf 2008. One of many career highlights is performing the Janis Joplin segment at the 17th Annual Janis Joplin Birthday Bash & Gulf Coast Music Hall of Fame 2004 awards show in Port Arthur, TX where Ramos shared a stage with Archie Bell, Frogman Henry and Jivin’ Gene. Ramos appeared on local news channels promoting her segment at the bash as the “Janis chick” and wound up selling out of her debut solo album, Scoot Boogie Baby’s, Lani Ramos. Consequently, Ramos received write-ups in various local newspapers, like the Beaumont Journal, to welcoming reviews. With an in-store performance at Louisiana Music Factory back in New Orleans, Ramos received wonderful accolades online and was put into rotation on New Orleans public radio station, WWOZ 90.7 FM. From there more write-ups ensued from Biz New Orleans Magazine, Louisiana Music Commission, and www.louisianamusic.org. In 2005, Ramos joined a newly formed horn band where Michael Wheat was the lead guitarist. 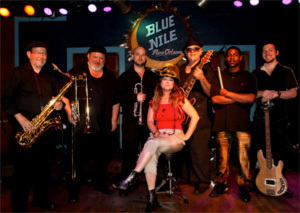 Big Pearl with Jake Legg & The Fugitives Of Funk opened regularly for Kermit Ruffins on Saturdays which started the “opening band” idea to the Blue Nile booker and owners because of its success. The band eventually received their own headliner slot weekly Tuesdays at the club. Up Frenchmen Street at Apple Barrel on Monday nights, Ramos cultivated an old time country/rock blues show singer/guitarist Ken Swartz. The band played sometimes until 4am with musicians sitting in all night long until Hurricane Katrina. Meanwhile blown away from NOLA into San Francisco, California, Ramos landed on her feet with regular weekly gigs at famed Biscuits & Blues music club. More newspaper write-ups followed in the Modesto Bee and San Francisco Examiner. In the Examiner Ramos is pictured between S.F. mayor Gavin Newsom and California governor Arnold Schwarzenegger on page 5, ‘Who’s In Town Today’, advertising and promoting her shows in the city as a bluesy New Orleans singer. Returning to NOLA, Mardi Gras, 2006, Ramos reunited with guitarist Michael Wheat and went on to co-write with Wheat 10 new original tunes calling the album BIG PEARL DOUBLE FACES. Ramos’ self–produced New Orleans rock & roll album has songs with funky horns, organ and classic piano, and others, with pop/rock flavors. 3 years later the album was released unmastered at LA Music Factory as a beta copy. The following year the album went on to be mastered and released through Flying Colors out of Los Angeles as a downloadable album and is on sale at CDBaby, iTunes, Amazon.com & at www.bigpearl.com. Currently, at the Blue Nile, BP&TFOF perform a weekly show on Monday nights playing songs off the album Double Faces. Fans enjoy originals, like, SHAKE THAT JUNK, IN THE N.O., and 1 LAST CIGARETTE, and also, with brand new originals, BIG BRASS BED, BOOTY IN THE BIG CHAIR and BORN TO LOOSE. Ramos is also a writer/producer/star of the band’s music video “Shake That Junk” and writer/producer/director/star of her own musical/comedy/variety TV show, YEAH YOU RITE! On-air locally in the New Orleans area on New Orleans Access Television (NOA-TV), Channel 99 Cox Communications, Thursdays weekly at 1:30 a.m. & p.m. Ramos showcases her skills not just in singing and dancing, but in sketch comedy too. Big Pearl & The Fugitives of Funk are expanding their live shows with bookings around town and around the Southern basin coming up in 2011 & 2012.